Meeting point is Via del Traforo 143 corner with Via in Arcione - in front of the Super Market. Reach the meeting point no later than 15 minutes before the tour starts. This activity involves a good amount of walking . Charming by day - absolutely romantic by night. To enjoy the whole center of this magic city in the moonlight, choose this pan¬oramic mix of bus and walking tour. Have you ever seen the Oscar Academy Award winner "La Dolce Vita" by Federico Fellini? The unforgettable scene where beautiful Anita Ekberg invites Marcello Mastroianni to join her into Trevi Fountain’s water…Our tour starts from here! 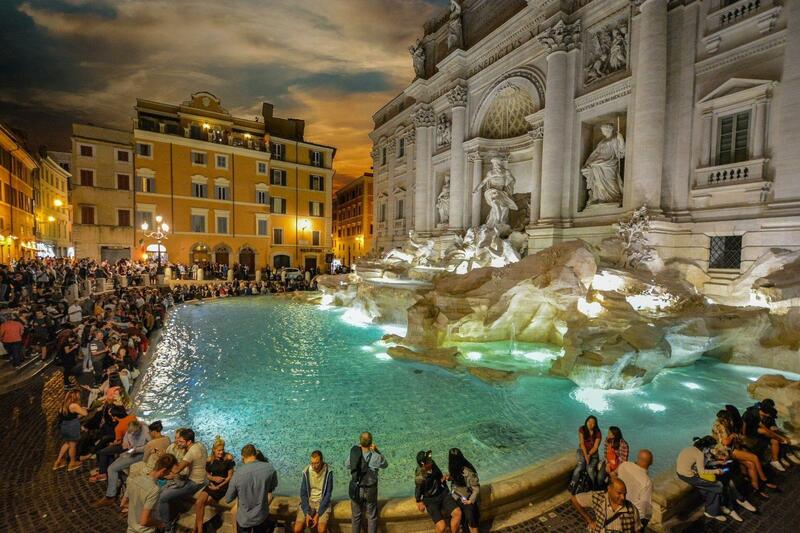 Our local Expert Guide will tell you about the marvelous Trevi Fountain and, of course, you will have the chance to throw a coin over your shoulder into the water, to make sure you will be back in Rome! Our walk continues towards Piazza delle Rotonda where you will admire the majestic Pantheon - the best-preserved Roman temple - and learn about the millennial history of this monument. You might recall Brad Pitt and Catherine Zeta-Jones in Ocean’s Twelve! Next, you will see Piazza Navona, a square beloved by the Romans, where you will admire the Fountain of the Four Rivers designed by Bernini and featured in the movie Angels & Demons and many more. After this nice walking tour, you will get on board our motor coach, to enjoy a relaxing panoramic tour and discovering the magical charm of the most famous monuments illuminated at night. The itinerary continues with St. Peter’s Square, Tiberina Island and The Mouth of Truth, that became legend after the release of the classic movie Roman Holiday with Gregory Peck and Audrey Hepburn. The coach tour continues overlooking Circus Maximus and the Palatine Hill and it ends with the symbol of Rome: the Colosseum! Take your best pictures where Ridley Scott’s “The Gladiator” was set and BUONANOTTE!